Iranian micro film "Dreams In Depths" won the best short film award at Mobile SIFF, a program at the ongoing 16th Shanghai International Film Festival that encourages young directors to explore the emerging new digital media channels. 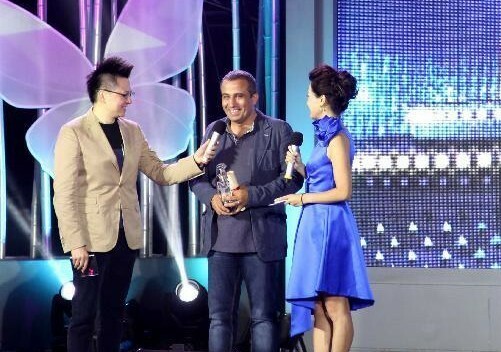 The Iranian director and scriptwriter Armin Isarian also walked away with the best screenplay award at the event, which was held yesterday at the Changfeng Eco-Business District. Twenty five short films from 15 countries had been chosen from the 2,064 this year for the final entry. The 12-minute production vividly portrays how the crisis of Israeli-Palestinian conflict had influenced the lives of ordinary people. Chinese director Zhang Siqing's "The Home Gleaners" won the best Internet micro film award for its reflections about society and human values through the eyes of a ragpicker. Dominik Hartl, director of the 26-minute Austrian film "Vienna Waits For You" was voted the best director award. China's "Breathe In Low" won the best documentary film award.